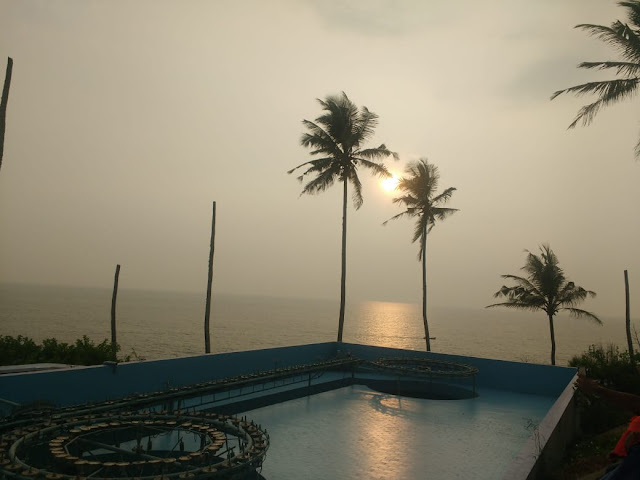 The last time I went to Varkala, it was a solo trip when my wife stayed back home with our new born. I had promised them that I'll take them to the places I visited without them last time. So that's how this trip shaped up as Kaniyan's first birthday trip. 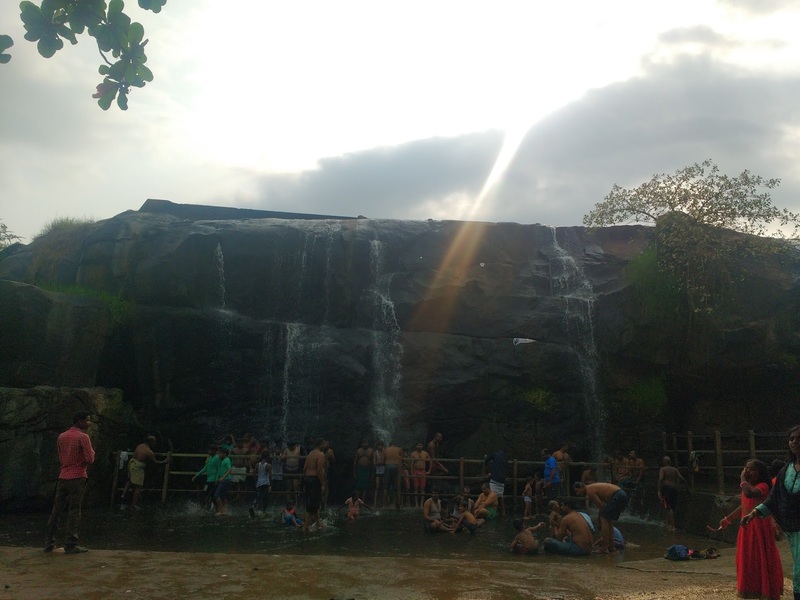 The plan was Varkala - Kovalam - Thirparappu falls and Padmanabhapuram palace this time. We booked the train tickets and rooms well in advance and were eager to see if Kaniyan will have fun in his first trip. We had booked the Tambaram to Kollam Suvidha express to kickstart our trip. 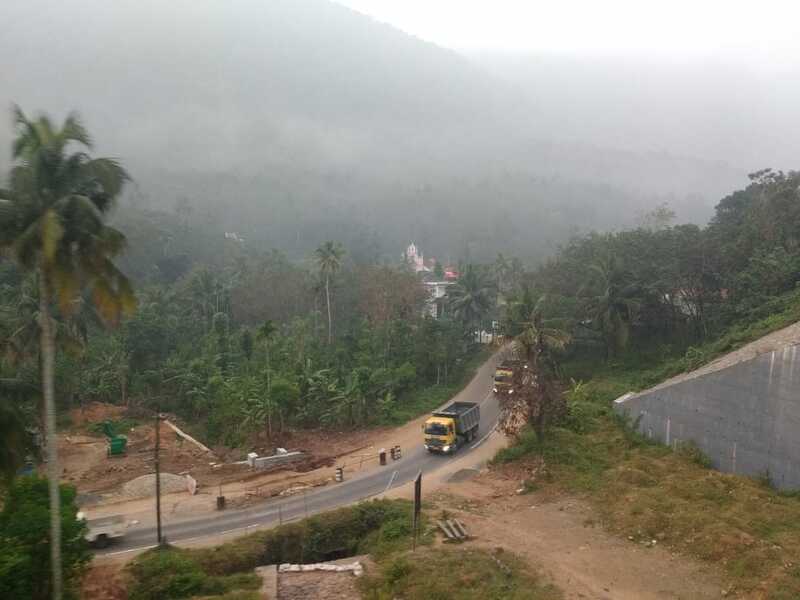 At 05:40 AM, the train reached Sengottai and from there to Kollam, the train took its path on the hill. 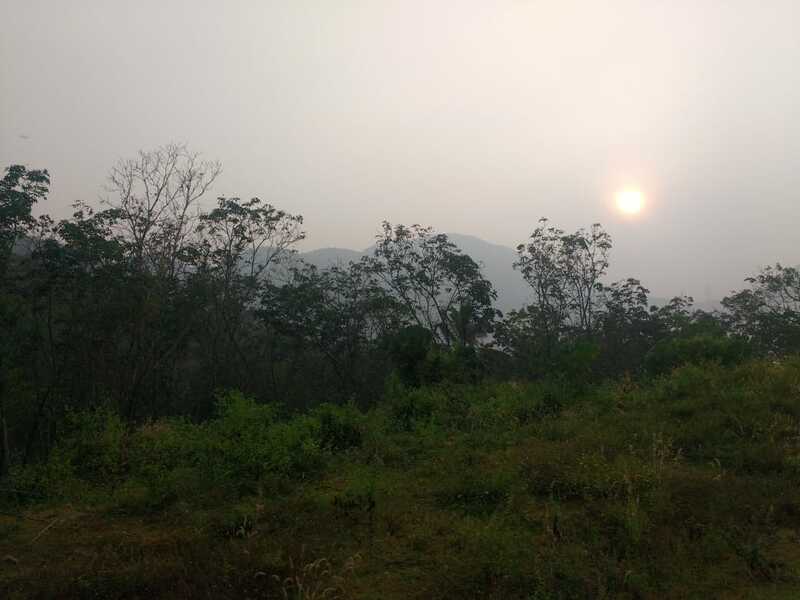 As the day slowly dawned, we could see the misty clouds hovering over the hill. As the train moved on, we saw the mist slowly giving way to the hidden trees. The path unwinded through numerous tunnels and curves along the hill with few houses here and there. We got to see such green beauty and passing streams while Kaniyan kept snoozing peacefully in an almost empty train. This train travel in itself was a dreamy experience and our trip started to get its meaning. We reached Varkala from Kollam through another train. The beach and our hotel were 3 KM away from the railway station. We started walking to reach our destination after a small refreshment. We could not help but observe the houses along the way. They were either huge houses with huge gardens or small houses with huge gardens. This gave a pleasant feeling even though it was sunny. Most of the houses we noticed had rainwater harvesting system installed in their rooftops. It was nice to know that the people living there were responsible of their surroundings. Deep down somewhere, I wished that how nice it would be if our city/town was also like this. But thinking about how we build up all available spaces and how we sit inside concrete forest and talk about modern economic development, made me feel somewhat sad. We reached our hotel and were welcomed by the sound of some group of friends singing "Happy birthday" for their friend. Smiling at Kaniyan, we took the keys to our room and freshened up. Then after lunch and some rest, we set off to the beach. The crowd was very less and nothing compared to my last visit when it was pretty crowdy. Kaniyan had a very good time playing at the beach. So we chilled for some more time there. Then we started walking on the cliff. The entire stretch is lined with hotels, restaurants and shops albeit with very less crowd this time, which is unusual for December season. 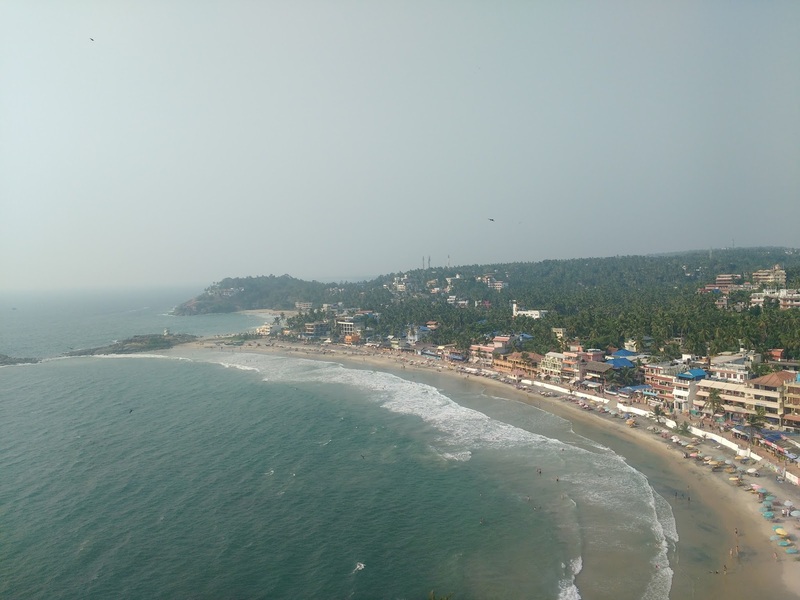 Walking on the Varkala cliff means there are hotels and restaurants with nice decorations and music on one side and the sea with it's never ending waves on the other side. Then we had our dinner, reached our hotel and called it a day. We reached Varkala station via auto this time after breakfast at our hotel. From Varkala we boarded a train to Trivandrum. On reaching Trivandrum while we were about to go to the bus stand, a policeman helped us out in getting an auto to Kovalam beach as it was hartal on that day and no buses were plying. We must say that from our experiences so far, auto rides are much better priced in Kerala than in Chennai and buses run on time at jet speed throughout Kerala. We reached Kovalam beach and walked to our room on the lighthouse beach. Crowd was less there too and our hotel manager upgraded our stay. We had lunch and in the evening we went to the lighthouse. 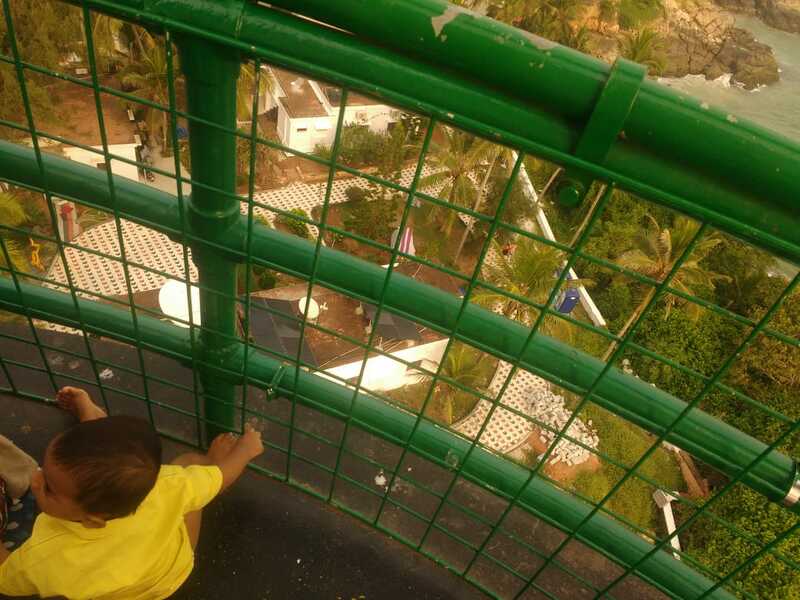 One can see the abundance of coconut trees from the lighthouse top. 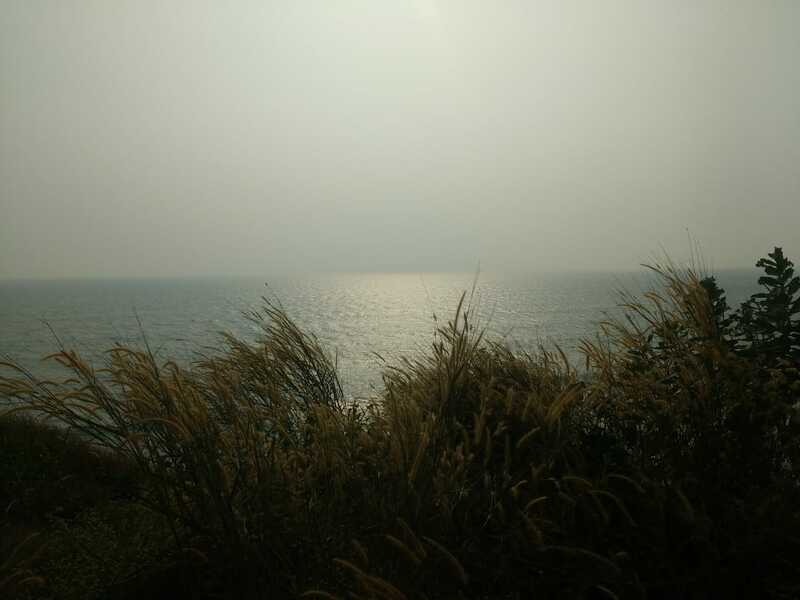 As acknowledged widely, the view of the sea from the lighthouse is a divine sight and I cannot describe it better in words. Just to top this, Kaniyan decided to run round and round the lighthouse and had a hearty laugh when we caught him. Then I swam for some time in the sea and had the chance of interacting with two localities and swim with them. Then we sat for some time on the beach while observing the surreal surrounding as dusk crept in. Though the crowd was less, it added beauty to the beach in both our destinations. At night, we could hear the splashing of the sea waves from our hotel room. It gave us a distinctive sense of contentment. 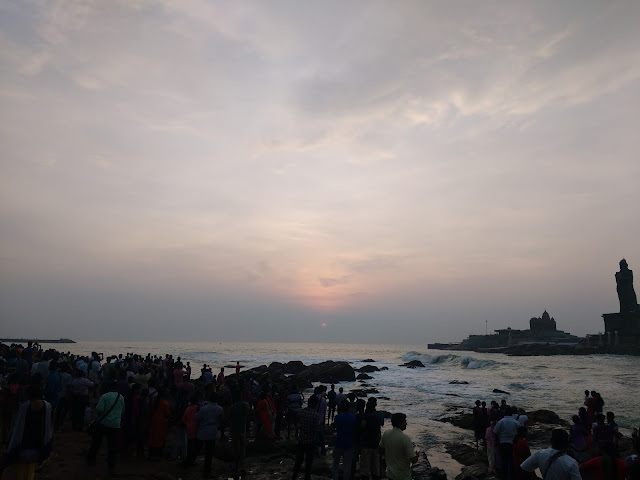 We got to know from the hotel managers and auto drivers that many tourists, especially foreigners didn't turn up or cancelled on them for two reasons. One is the nippah virus scare and the other is the flood. Otherwise this used to be their flourishing season. 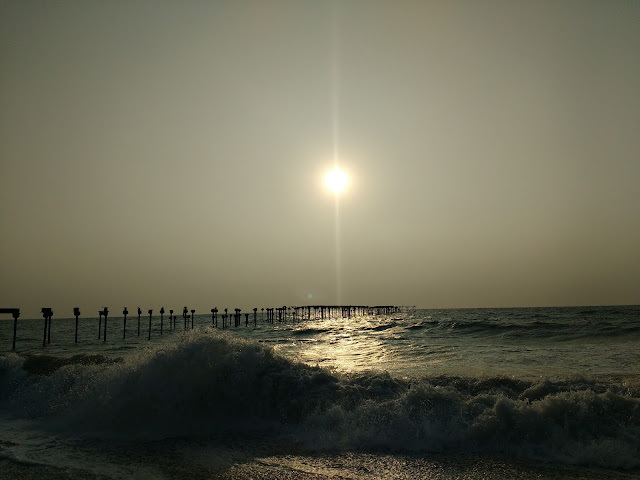 From Trivandrum, Thuckalay was 60 KM away. So we thought that we could reach in one and half hours. But the route went inside the city and the towns on the way. And our bus had a breakdown. So finally we reached our room at Thuckalay at 02:00 PM. 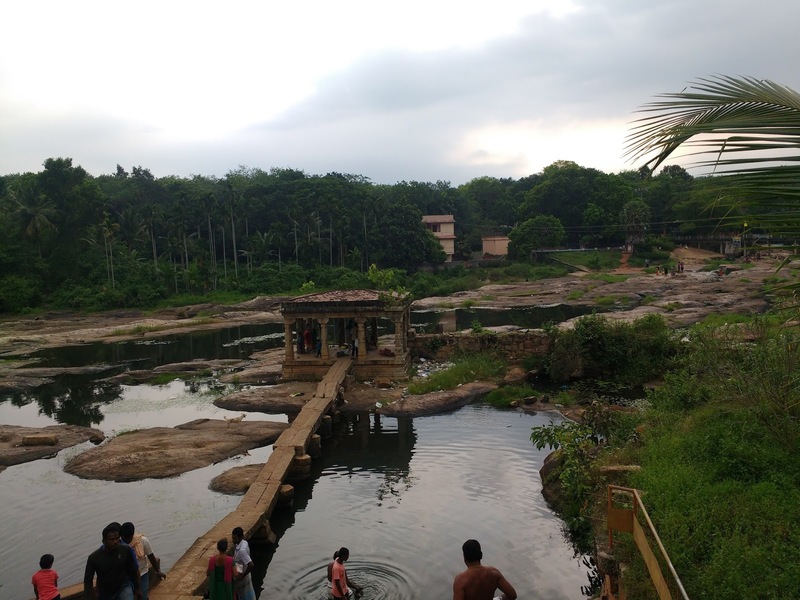 From our room, it would take more than an hour to reach Thiruparappu falls via bus as it had numerous stops on the way. While we were thinking about it, our host offered to lend us their bike for rent. We enjoyed our ride to the falls. We could see the western ghats yonder and nearby too the roads were surrounded with trees and vegetation. It was a cold day. 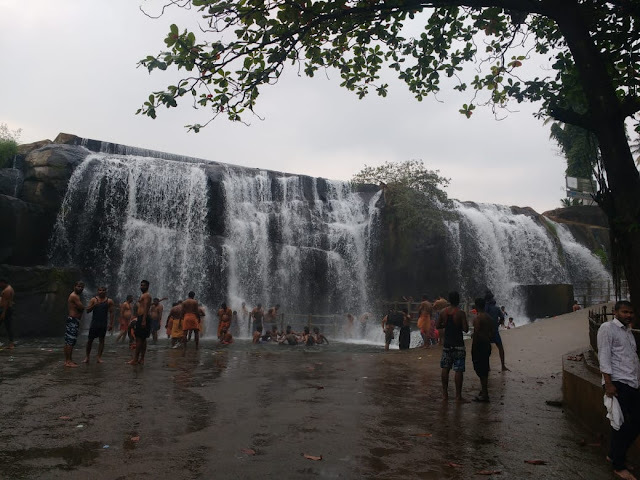 We reached the falls and completed the ritual of bathing in it. Then we went to dam from where the falls originated. We saw an elephant taking bath too and I had a short swim. After this, we felt that the entire day's travel was totally worth it and we returned to our room. Since the palace was close to our room, we took our time to start the day. The palace had the royal feeling intact with the traditional furniture, building style and materials used dating back to the 18th century! We were like, "What a life the kings had". Then we visited the museum. 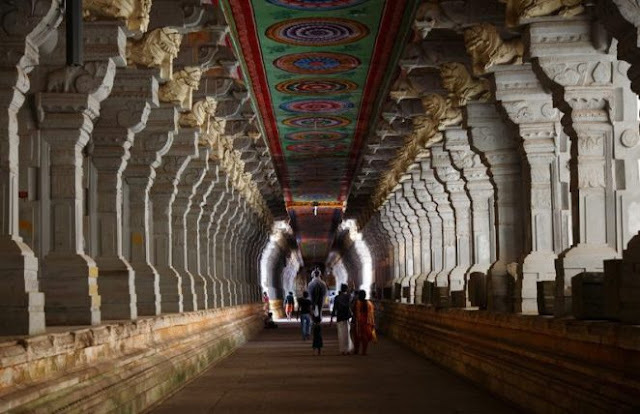 It had ancient sculptures and rock scriptures, many written in Tamil. Then we returned to our room. After lunch, we boarded a Kerala bus to Nagercoil junction. That route also had some nice views of farmlands and mountains and then we reached the junction. 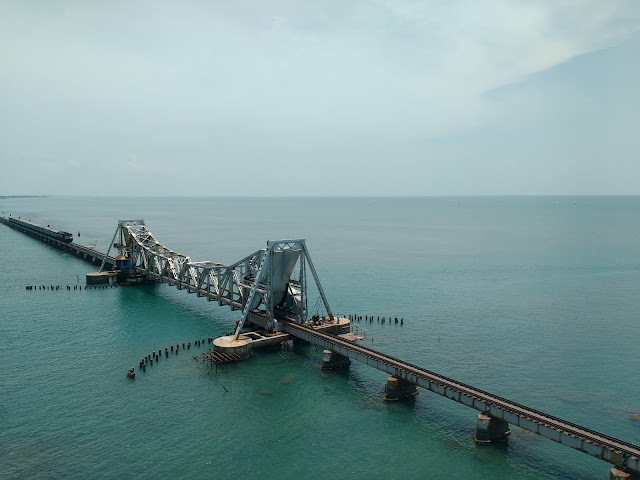 With that, our trip ended and we just had to board our train to Tambaram. In this entire trip, Kaniyan coped up well and didn't give us doubts on our decision to take him to a trip so soon and in a cold weather. His food habits let him have something from everywhere we went (only less spicy). So he enjoyed the trip with good food, good playtime and good sleep at night. We were happy to have celebrated his b'day this way. Celebrating our kids' birthday with friends and family sure gives happiness but in our opinion, often is a stage to showcase where we stand in the society, to the people in the society. Going to such trips that take us closer to nature only makes us feel how far we have moved away from nature. With this guilty realisation only this trip ended. Riding is a really fun activity. Along with the fun, also comes the responsibility for one self and for others. Unlike other travel options, bike riding has its own advantages and challenges. The liberty and freedom in unmatched when comparing with any other travel option. Preparing for a ride is pretty important. Anything less than 500km would not need a serious preparation, still need some basics taken care. This is to make sure, we do not waste time while on short rides, take care of our safety and others around. Here is a list for reference, feel free to let me know if we need to add anything more. Riding gear: The only purpose of it is to make sure you are up and can take care of yourself in case of an eventuality. Basic starts with a tough jean and a glove. Even a basic glove is good enough as we get our palm to support intuitively. To have it padded or protected will give us the confidence to use it without fear. A shoe that can protect your feet. Hard one will be preferred. These three I would say is the basics for rider and also for pillions. If you want added protection, a basic ankle and knee guard will cover all the initial impact points. Level up will be riding shoes, riding pants and jacket, which gives you protection in case you had to slide. (Optional) This is for solo rides. Share an option to track you down in case you do not contact for a specific period of time. I would usually leave my google login, so that my mobile can be tracked without activating real-time share which will drain the battery. Make sure the bike is in a good riding condition. Brakes working properly. Side mirror is a must for highway riding. Even on a straight road you will need eyes all around you. Side mirrors add a couple. Plan for wet condition. Always carry enough covers to protect your dry cloths and electronic gadgets. You may never know when this will come handy. Always have water with you. At least 500 ml all the time. This is for drinking, cleaning, first-aid etc. Carry some snacks with you, compact. I would suggest groundnut burfi as it will take care of your protein, carb and sugar needs. There are days I cover distance just snacking on these burfies and settle for a good dinner when sun is down. If you are planning to get lost, carry a compass with you. Download and keep offline map of the places you are planning to visit and if possible, the whole route. I usually lay down everything on the floor before I start to pack. I also take a picture, tat way I also know what went in and possibly which bag. Riding is not everyone’s cup of coffee, but still it is not a bad idea to try that coffee and decide if it is yours or not. 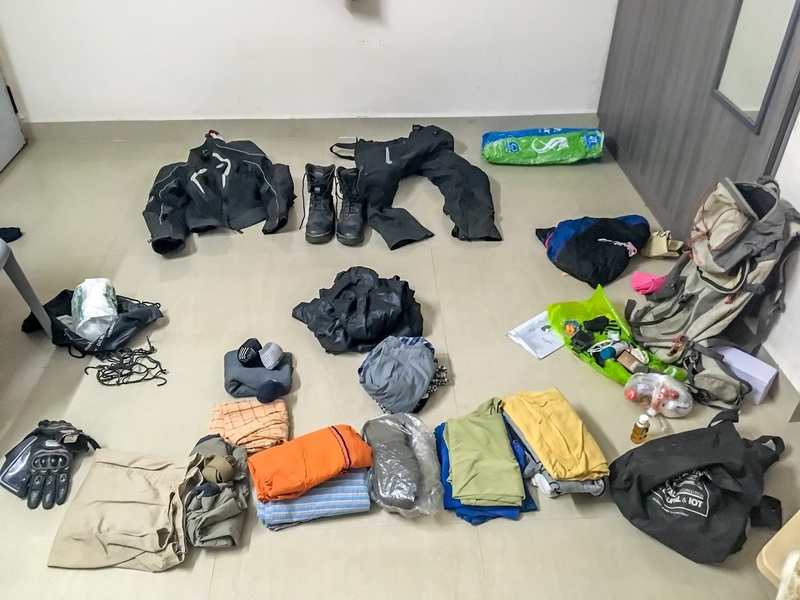 This blog should help you get prepared if you are planning to venture out and try it for yourself alone or as a group. Be responsible on the road and have fun riding! 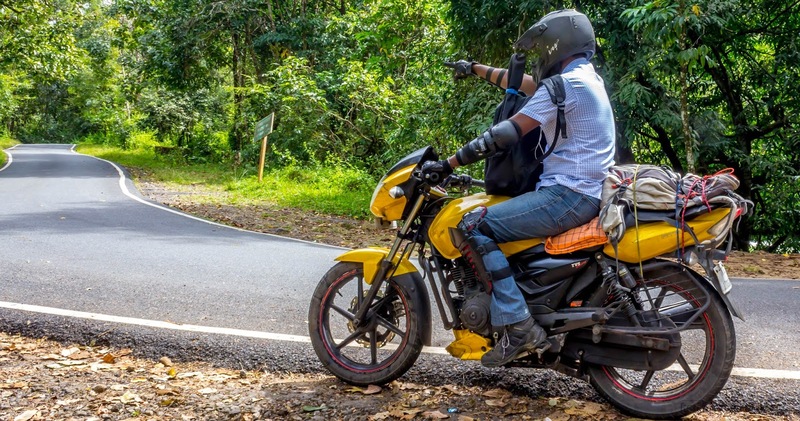 If you are interested reading, click here to read my first first solo ride covering Coimbatore - Coonor - Valparai - Athirapally and back to Coimbatore. This is an unplanned ride. It is a shock to most of us to see our trusted source of protein, fish is glazed with substance like Formalin. Formalin is Formaldehyde in water. Formalin is primarily used to preserve tissues from decaying by killing the bacteria which caused the decomposition. This is the reason Formalin is used to preserve dead bodies and during the embalming process to preserve a dead body for longer period of time. There are different fishing techniques used. Traditional fishing are human powered, they do not venture out for weeks and would return to shore once they have a catch. This is almost a daily activity. 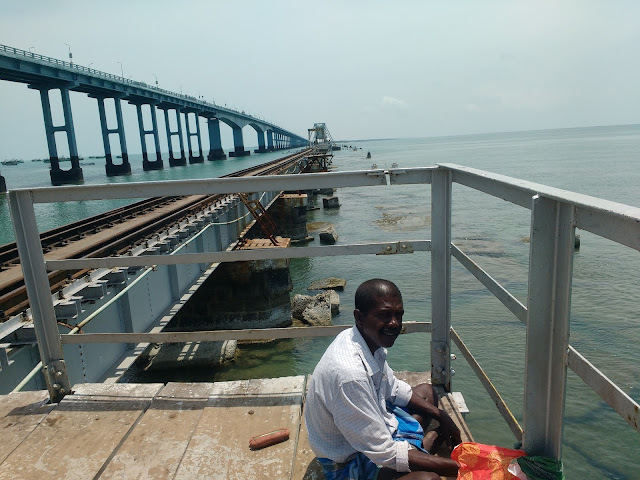 With the motorized boats and ships, fishermen can venture in to the open ocean for weeks and could also stay in for months before they bring back their catch to the shore and sell them to factories and markets. Primary mode of preserving the fish is cold storage. Fish is packed with crushed ice and stored in a thermal insulated environment. Just this can store fishes for days and some cases even weeks. Greed and ease of use has introduced Formalin in to this simple process. 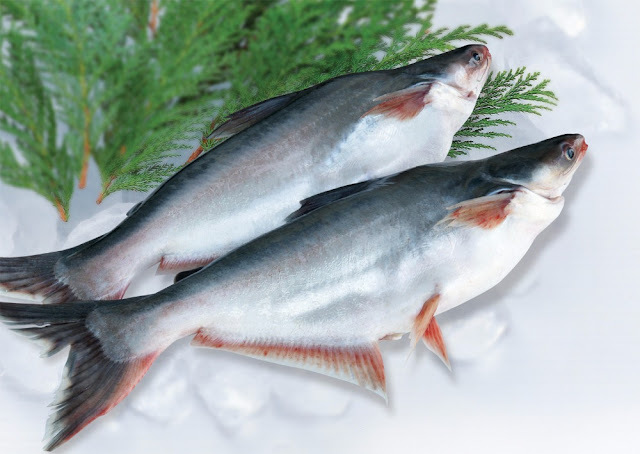 Formalin is sprayed or in some cased being added to the ice itself to preserve fishes. This way the fish looks fresh for days or weeks. Why Formalin is a problem now? This problem is all around the world. Many countries have stringent control over permissible amount of Formalin in food items. In few countries where the food authority is not stringent, people have a free hand to play with our food. With the reports of fishes glazed with Formalin found in Kerala, that were brought from Tamil Nadu was the red flag. TN gvt did not jump in to it right away, The Hindu conducted their own investigation and reported this story with all the necessary evidence. It was only then it was a wake-up call for everyone. News media started reporting and Gvt from their side has gone in to a defensive mode to avoid panic. Ex gvt officials have now come out telling that Formalin and in some cases even bleaching powder is used on fishes to keep them fresh. After the news from the South, now reports are coming from Assam, Odisha and other parts of the country that Formalin is found in Fishes that are meant for human consumption. These substances even in traces could cause long term kidney, liver and lungs related problem. It will cause itchiness in some cases and also breathing problem for few. Unconfirmed reports also say long term exposure to Formalin may cause cancer. Only Fish or what else? Formalin is not used only on fishes, when the greedy wants to make money, you and me are the victims. Formalin is quiet literally used on all forms of animal meat, milk, fruits and vegetables to increase their shelf life, so that the industry need not waste what can be sold if it can be kept fresh for a longer period of time. Only the fish industry has come under the microscope, others would when there is an incident and media houses see there is a 5 min story they can report, until then these will go on. How to remove Formalin from Fish, Dry Fish, Vegetables and Fruits? Formalin forms a layer on top of the food item that is sprayed up on, it is always best to peel off the skin of the vegetable or fruit if you do not know the source or the preservation method used before it lands on your shopping basket. Formalin is water soluble, we can take advantage of this property and dilute the concentrate of formalin in the food. 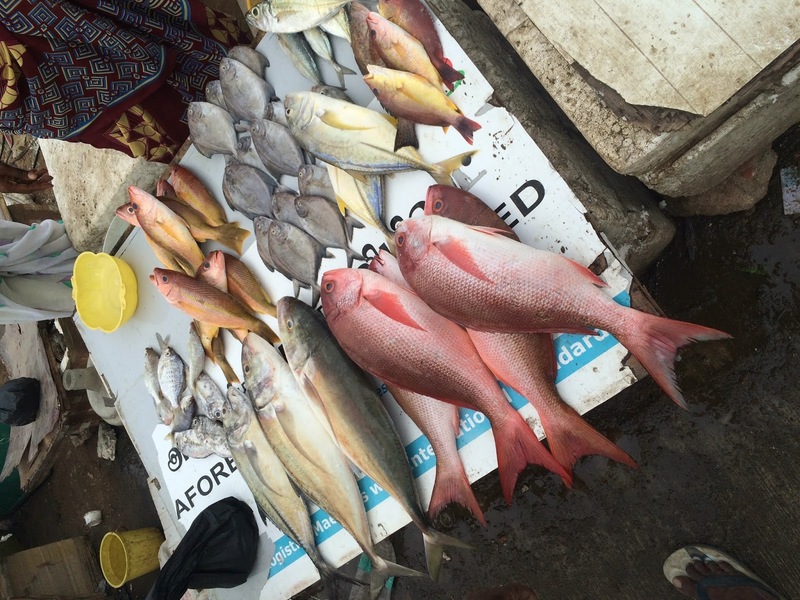 You can soak the fish, vegetable, fruit in fresh water for an hour, this is dilute Formalin, you can then rinse it well and again soak it in water for another 15 min to remove any trace of Formalin again. A better method will be to use salt along with water while you soak it for the first one hour, salt will help break down Formalin better. If you are fine with the taste, the best method will be to soak the fish/vegetable/fruits in a solution made from 95% water and 5% cooking grade vinegar. Also add in a pinch of turmeric powder along with this solution. Once you let the food item soaked in for 1 hour, it will reduce the concentrate. After this, rise the item completely and let it soak in fresh water for another 15 min before you start cooking. Formalin in milk cannot be cleaned. You can only see for yourself if any unnatural preservative has been used. If you have a doubt on the milk that you receive, take a small sample and leave it outside without refrigeration over night. Raw milk will go sour (get spoil), if there is no preservative used. If the milk is still fresh even when you boil, there are chances of foul play. Unless our Food authorities take strict action against those people behind this toxic practice, people will still have a free hand to play with the food we eat. More over, we are paying for the toxic we buy and eat. In this day and age, being aware and asking the right questions is the first line of defense. 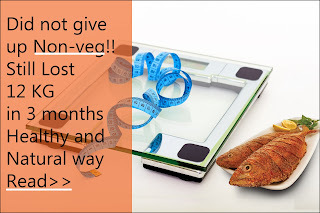 I hope this blog gives you some information and will help you in making a right and healthy choice when it comes to your food and how cautious you can be for yourself and your family. With a toxic filled world, this is just one more to beware of, this will not stop me from having my fish. I will just be cautious and me personally will continue to have my favorite fishes. Think before you start reading. Yes, you read the title right, this whole trip I only had water and did not have any food. After reading the title don’t think I am a loosu payan and all.. I just want to check my health condition without taking food for a few of days. I want to understand how my body behaves with no food intake for a few days following a water only fast. Three days leave was approaching, everyone started asking me engaium polaya. Earlier I planned to go on a outing with my travel buddy. But close to end of the week he revealed that he is going to change his marital status from single to mingle (engaged). Ivanum poitana Apo ootyku thaniya than ponuma dialogue came to mind. My parents went to my sis home in the begin of the week, they forced me to join with them but how these days young ppl will join in family occasions ;) , so I decided to stay in my home. Friday morning I got calls frm my frnds.. 'enna ma veliya polaya'. These kind of words Usupeathing (induce) me to go out and I realized anyways no soru for three days in my house. Around 11.30 am I decided to go somewhere in South Kerela and I checked the famous Indian IRCTC website for south side trains and I booked Chennai to Trivandrum mail 3.20pm with waiting list. Yen ivan andha oora ah choose pana ?? My Pankali Maari (friend) had been there for 2 days. He suggested its a kind of good place for solo trip. Here is his write-up. I received a message from IRCTC that my ticket is confirmed S12-RAC 71 last person of reserved candidate in that train and I deserved it. I bought 1 litr water bottle for entire journey and boarded into train, when I entered the train everyone stared at me like a low rank holder guy in school.. ennaa RAC ah.. But its horrible to sit there near to toilet..and I booked my return train tkt for next day. Landed safely in Triavandrum with help of one ltr water. And I bought another 1 liter bottle. 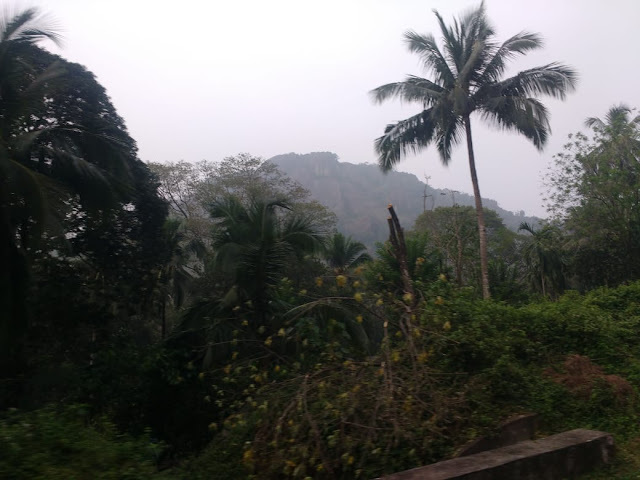 From station to Padhmanaba temple its around 1km I walked and reached the temple. Everyone inside the temple were in dhotti. So I refused to enter the temple and salute him from the front gate and he wished me - stay blessed. 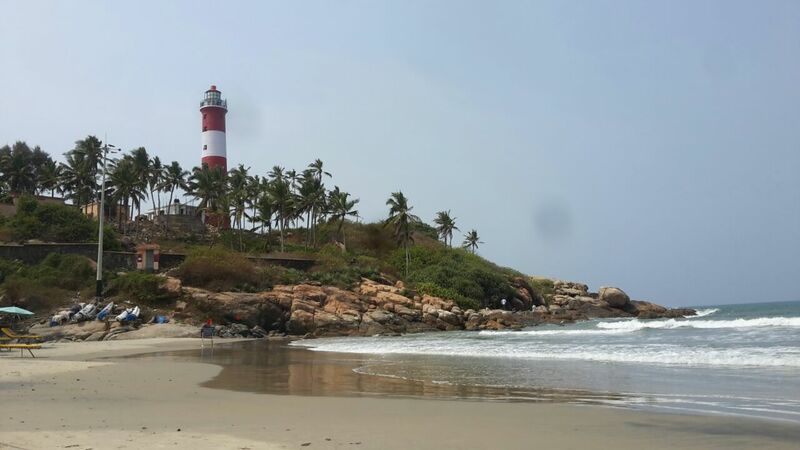 Next move to Kovalam beach, from Kovalam jn to beach hardly 3kms I walked from the junction and reach the fisher man area , Kovalam beach, Vizhinjam beach and Light house.. such a beautiful place with girls all around. And foreigners in bikini suits. Some sensor cuts also happened. 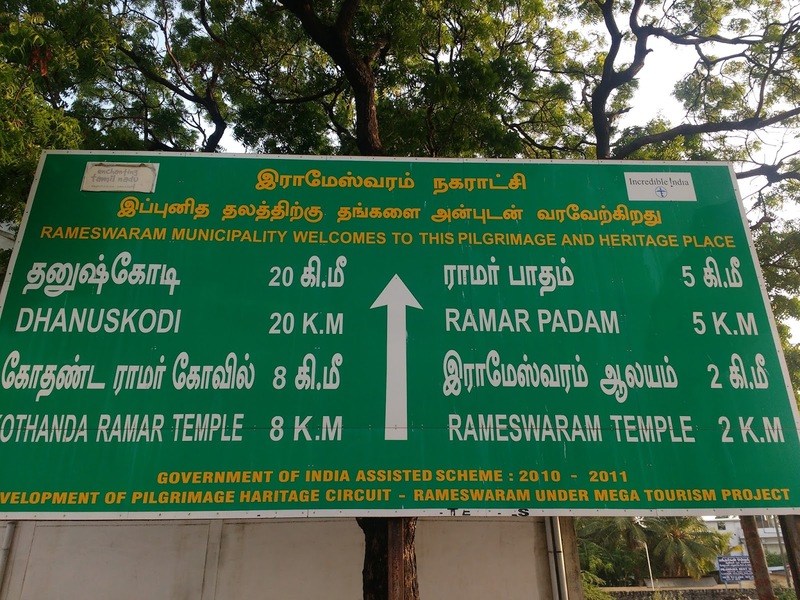 But Only for watching..
Then I started to walk to Kovalam jn but google doesn't support the navigation and reached azhakulam jn almost 4kms I walked extra.. 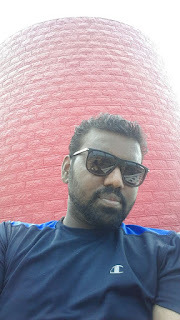 I asked so many people for the route and km but they said like dho km dialogue frm dheeran movie. Got into bus and fully wet, everyone looked at me unknowingly and simply sat down in one seat.. Oorama irudhutu poiruvomnu nenaichen. But co passenger didn't allow me to sit as a single. Reached trivandrum eppdiyo and I got a train to Varkala beach since its unreserved coach I boarded before train stops and occupied few seats. Since I had plenty of experience in foot boarding its easy for me.romba length pogutho ok.
Then I gave a placee to one malayali girl and she helped me to get down in varkala station, in that 1 hr journey I forgot to ask her name too.. ipo puriuthu thats y am single and going this kind of solo trip..
Reached varkala station. 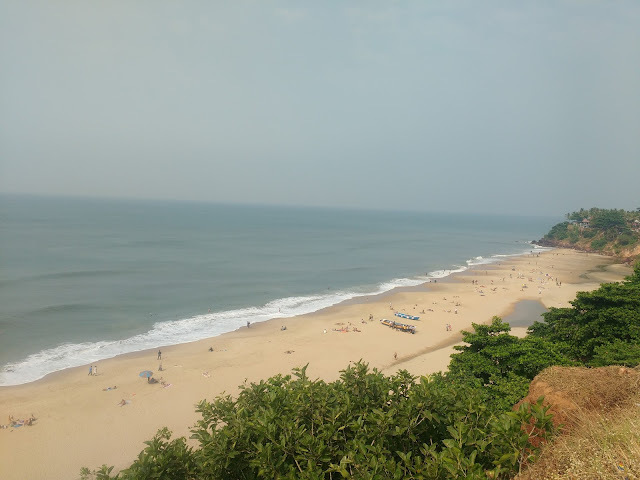 From station to beach 3 kms whn I asked for the route people around there told me get into the auto but I walked directly to beach in mid of sun burning. 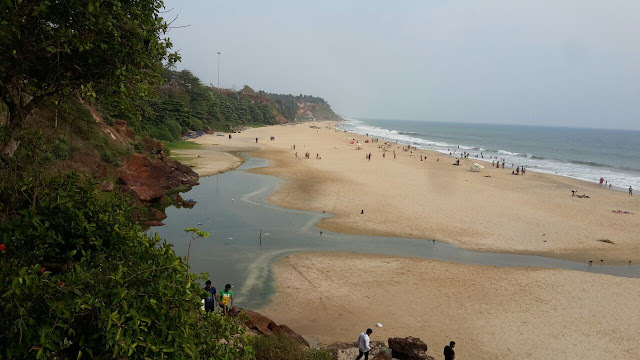 Varkala an amazing beach have wondering topography something its different. 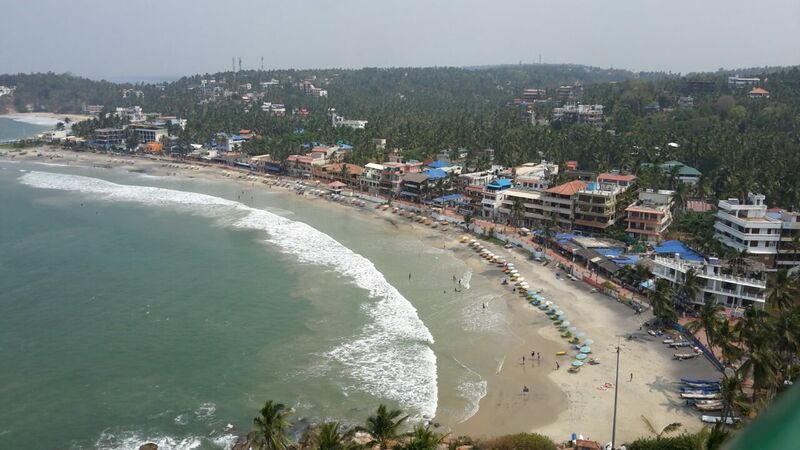 Nice to see beach in that elevation level..
As same like Kovalam beach but here I could see more of families and foreigners and crazy girls.. I walked twice from start to end and swim taking rest and done the same for while. When I had to get into sea, my bag got to be alone and I had to look at my bag only not even the waves. So got so many slap from the waves. Namaku bag than mukkiyam.. 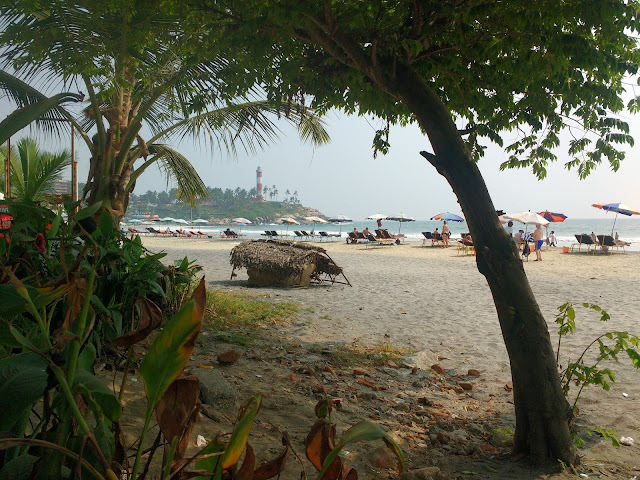 But enjoyed lot and started to roam in beach side shops for window shopping.. varkala night life its something different I wonder like is it India!?. it look like western country which I have seen in English movies. Stalls with delicious food ever where of the sides but controlled my mouth drunk water. Then I started to walk towards railway st and I reached edawa beach OMG again I drown into beach because of poor map reading skills.my train in Trivandrum 8.20 but current time is 7.20 totally tangled, I decided to catch the train in Kollam jn. 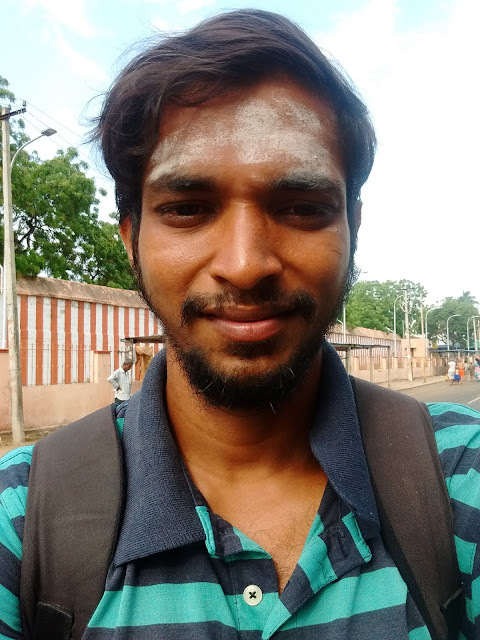 and I widened my foot steps stretched my level and walked to reach the varkala station.. its 6 kms walk mudiyala da samy.. Oru auto and bus kooda ila andha route la ..
Boarded and had a nice sleep..
Reached Chennai by 1 pm.. Thanks for reading my mokkiais, during this trip I had 4 litre rail water only and I walked 32+kms entire trip. 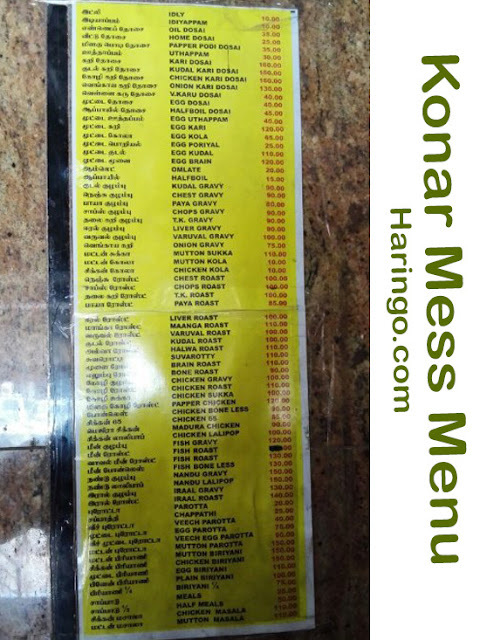 To all those Non-Veg lovers, here is Konar Mess Menu card, Simmakkal, Madurai menu and rate. Last time I went there, I was asked to check for the menu on these sheets pasted on the wall, I instead took a photo, came back to my table and then placed my order. I am saving this trouble for you now that you can go through this menu card along with all the items listed with necessary English Translations. If you Fish names from Tamil translated to English, you can use this list here with downloadable PDF. Note: Kudal is generally only the Goat's intestine. But in Konar Mess, you will find them adding Booti (Stomach) and Nora dabba (Lungs) along with Kudal. It is still yummy, I want to keep you informed on what you can expect from this real authentic place. I love to travel and try some goof food on the way. Madurai is one of my favorite region to be around with different specialty food available in and around this region. If there are any changes to this list, please leave it in the comment, I will have this updated to help others looking for this information. 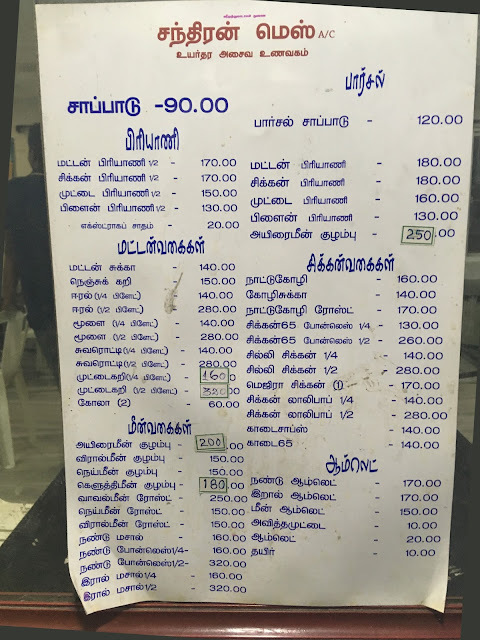 To all those Non-Veg lovers, here is Chandran Mess Menu card, Thallakulam, Madurai menu and rate. 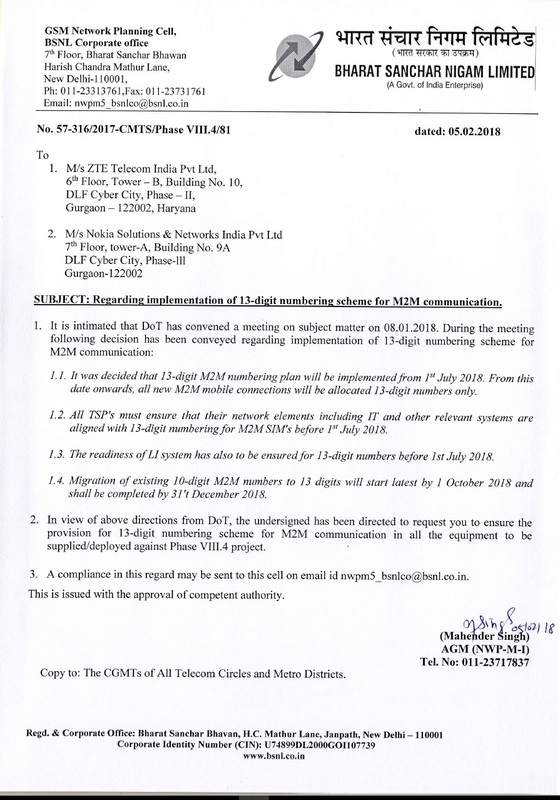 You are reading this article as you come to know that the mobile numbers will be changed from a 10 digit format to a 13 digit format from July 1st 2018. This message is true, but the interpretation is false. 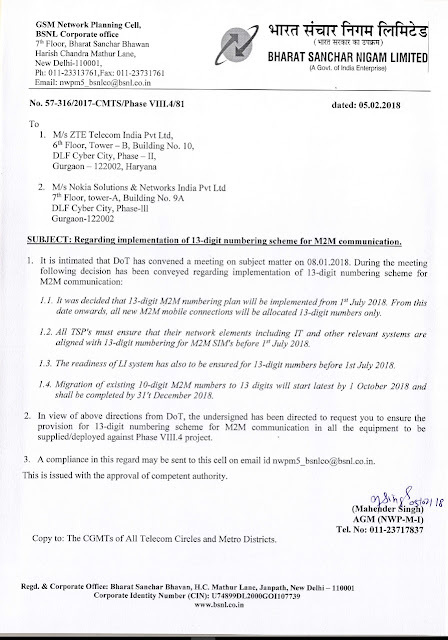 The message clearly says this is for M2M communication. This is Machine to Machine communication. These are communications that does not cover our mobile communication. These are for Credit card processing, Debit card processing, GPS system, vending machines etc. I will not be surprised if this even makes in to news media, due to the chaos this message can create in common people. We can safely say this message is a Hoax as it is a wrong interpretation of a message, which is the only reason it is making its rounds. to contact the NGO - Prerana (Supported by Infosys foundation). This message has a classic sign of what we call as a data junk like a space junk. this does not have a date. Checking the link, you see this program was available in 2015. Also the numbers are not valid anymore. So please do not forward this message if you have received it. This is not a spam, this is a real message indented to help someone, but not currently out of relevance as this is from a long time back. You have a message and not sure if it is a Hoax or spam or phishing? If you are interested in checking if an email or message is fact of hoax or phishing, you can leave it in the comment or send it to haringo.com@gmail.com. We will try our best to analyze and get back to you. 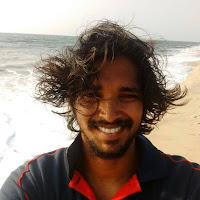 This is a contributed blog by Maari. Maari is a traveller, trekker and has completed the most grueling Ironman Triathlon. 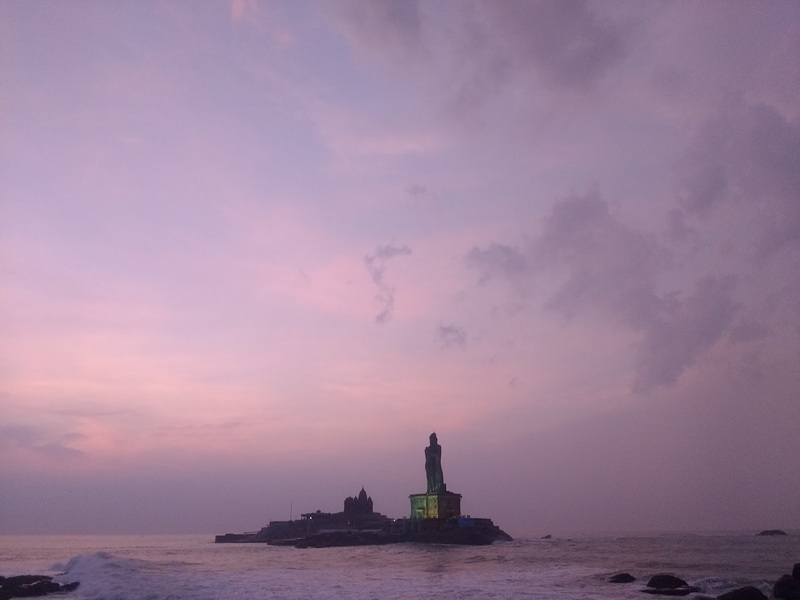 For the past one year, I couldn't travel due to few reasons. Now that I decided to travel, I was looking forward to the long weekend this Republic day (2018). My wife agreed * (*conditions applied) to let me go on a trip this holiday. The condition was to take her and Kaniyan (our cute 1 month baby) to the same place wherever I choose to go, later when he's old enough :). So my trip started with this agreement. My friend and I planned to go to Bangalore initially. My bro Hari then suggested an idea for solo trip. It turned out that my friend couldn't make it and then I decided to set out on my first solo journey. 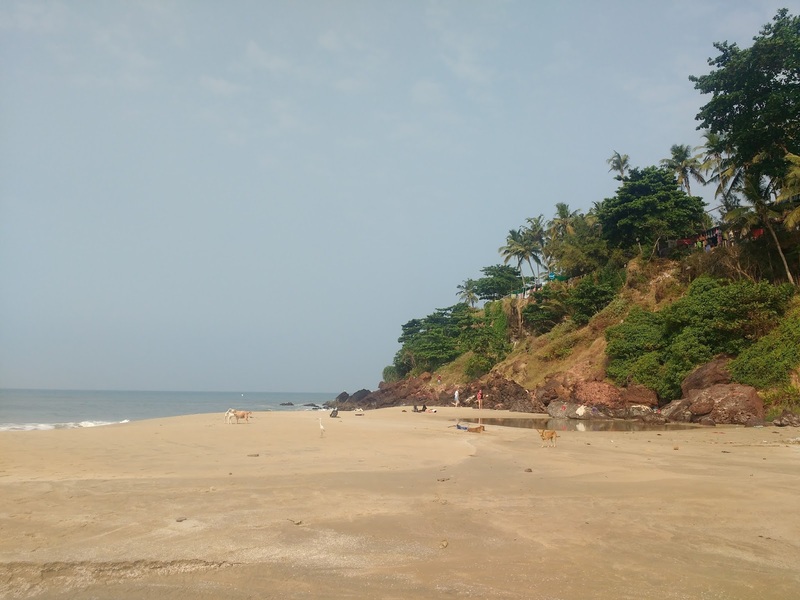 I am a big fan of beaches in Gokarna. Expecting the same kind of an experience, I decided to check the beaches in Kerala. Hari bro had already been to these places on his own and I too prepared to go alone to these beach destinations. Since it was a long weekend, there were no tickets available. My only option was to try booking tatkal train tickets and luckily I got them. 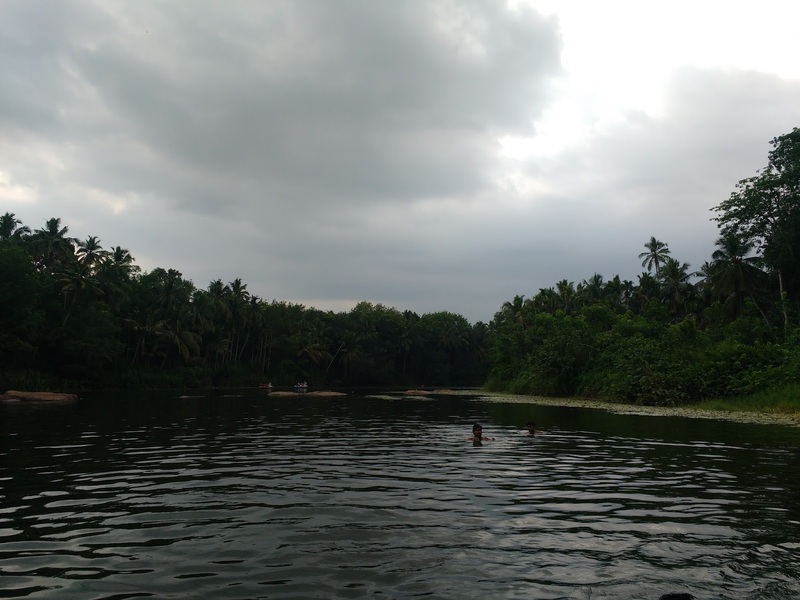 The route to Alappuzha while on the Alleppey express between Ernakulam and Alappuzha was breathtakingly beautiful. Lots of coconut trees and frequently passing lakes were a treat to the eyes. 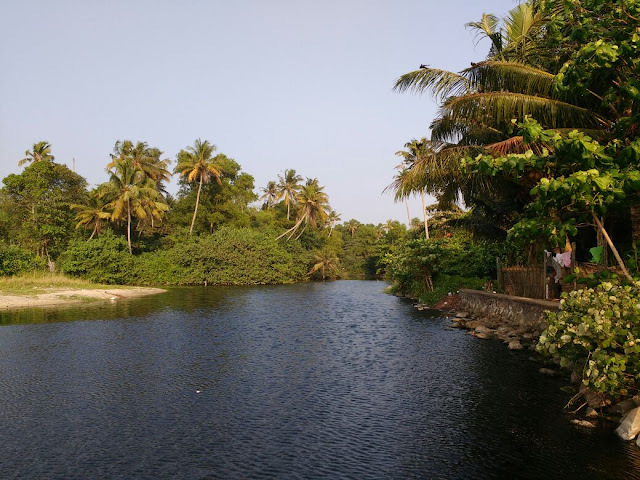 Finally reached Alappuzha at 10.30 am. As I had come alone, I had booked dormitory rooms for both days. My room was 1.5 km away from the railway station. I reached my room on foot. 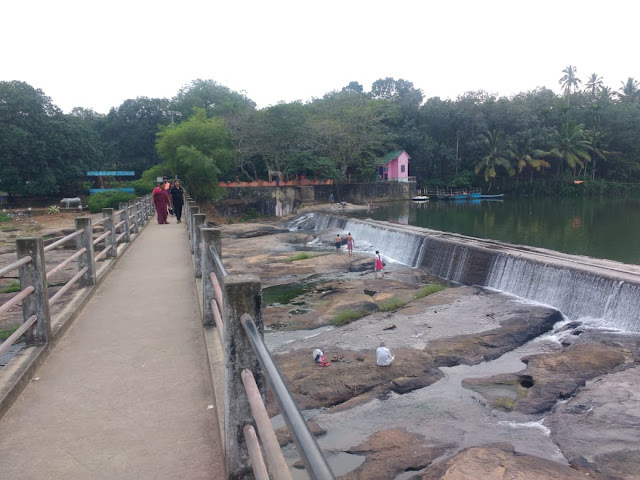 After freshening up started to checkout this places around and went to the backwaters place (boat jetty). 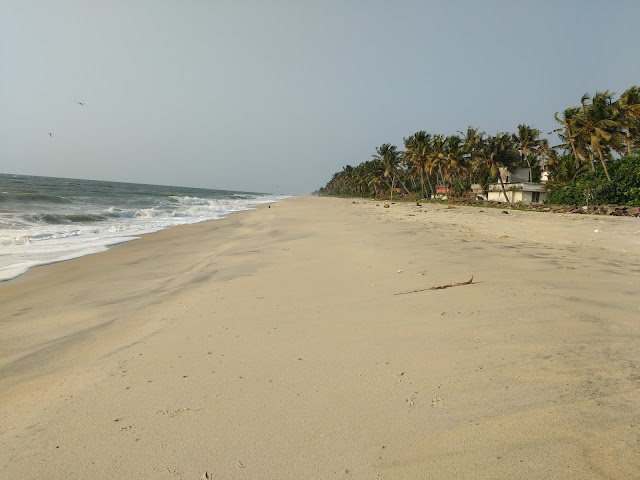 Then started to look for Marari beach, I had thought that Marari beach was nearby but it was 15 km away from here, so planned to skip Marari beach and spend more time in Alleppey beach. It was time for lunch already, it was Kerala meals for lunch in a nearby eatery and took some rest in the room. 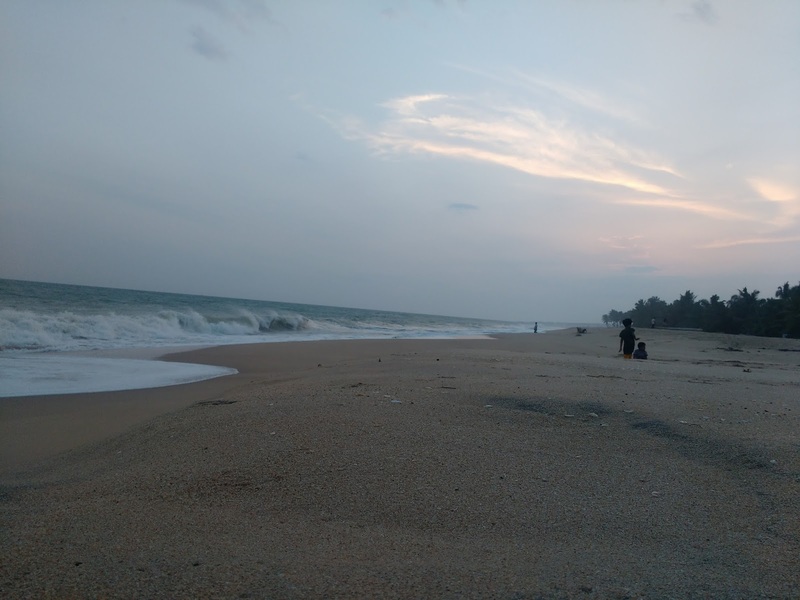 The evening was blissfully spent in the beach from 4:00 pm to 7:00 pm. It was the best thing this day. 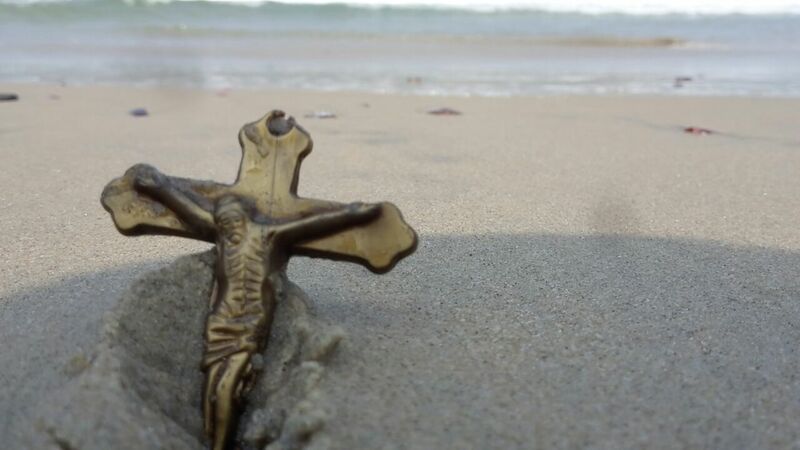 With memories and thoughts inside and the beach outside, I felt something that can't be justified with words. Then found a roadside food stall for dinner and had beef, dosa and idiyappam and returned to room. Spoke to a co-traveller for some time in the room. 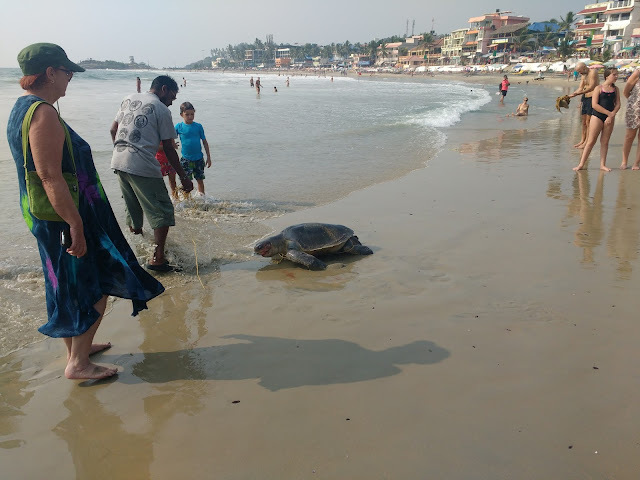 He suggested staying in Marari beach is better than staying at Alleppey beach. Then he told about his boating experience. Boat jetty ride is available with government and private boats. They will take you for 2-3 hours and charge Rs. 900-1200 (depends on your bargaining ability). Private ones charge you Rs. 500 per hour. 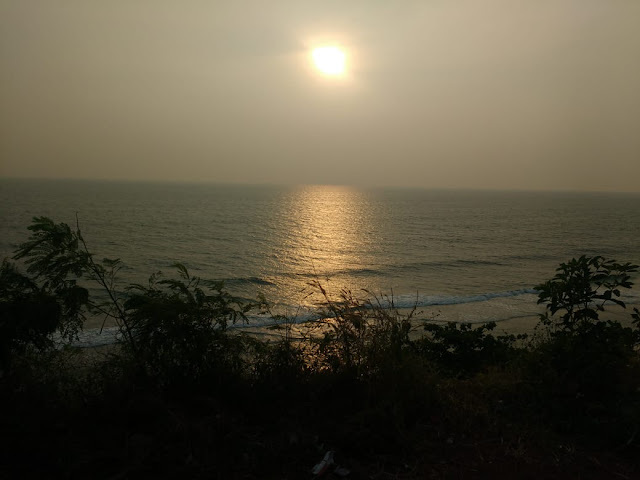 Next day I reached Varkala via train again. 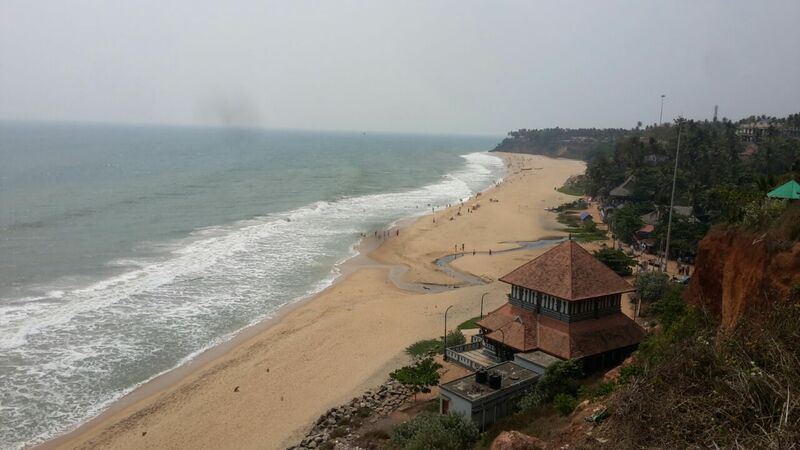 I wanted to spend more time at Varkala. So had booked train at 6:30 am and reached Varkala railway station at 9:15 am. The dorm room I had booked was 2.8 km away from the station. Again walked and reached my room. 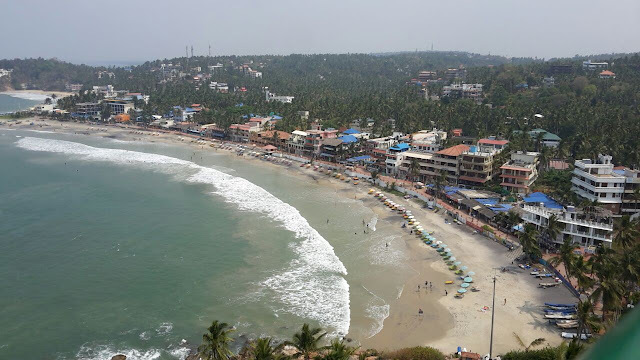 What a scenic view it was to see the sea from the helipad area! I badly wanted to take a plunge in the waters but waited an hour as I was tied to book my return tatkal ticket to Chennai. After booking the ticket, kept my bag in the room and swam for an hour in the sea. 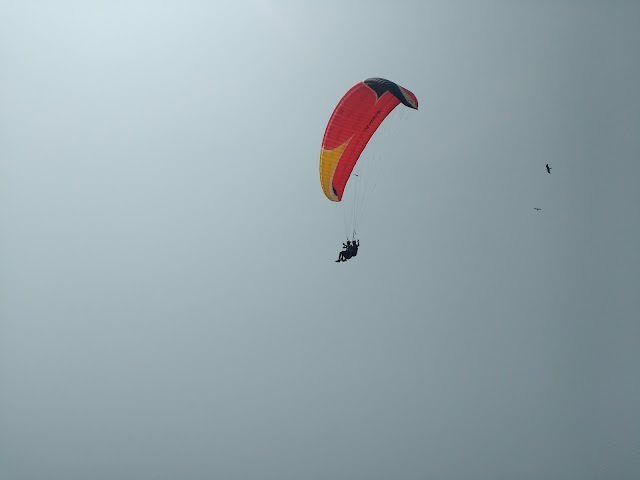 Then there I saw people on the Paraglider. It costs Rs. 3500. I observed the ride for some time and left the place. I walked for some time, had lunch and took rest in the room. The dorm was mostly occupied by foreigners. The thing I liked most about them is that they didn't disturb others. Even if they had come with friends, they always gave them their private space for their own me-time. It was a good thing I observed in them. I started the evening walking over the cliff. Shops and restaurants lined the entire length of the cliff. I kept walking and the line of shops were never-ending. After a point, I started walking back towards the room. Fresh sea food were showcased in front of every restaurant. They prepared and served whatever we wished for. Next day started with some walking, exercise and swimming. Then I went up the cliff and walked to its end. There were only restaurants and hotels. Some were remarkably rich and beautiful. 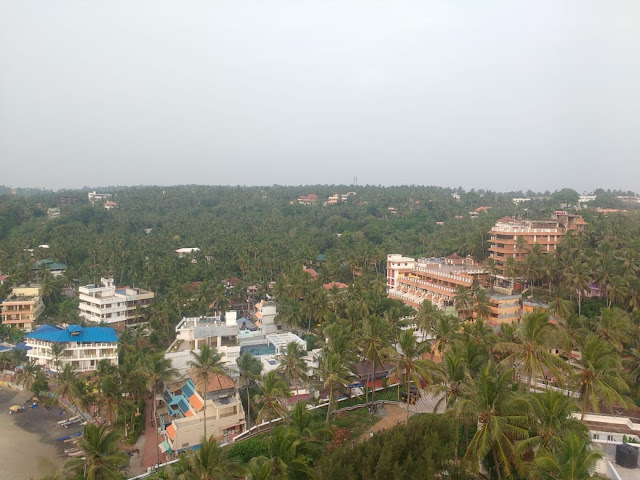 I vacated my room and went to Trivandrum. The travel was one hour from Varkala. 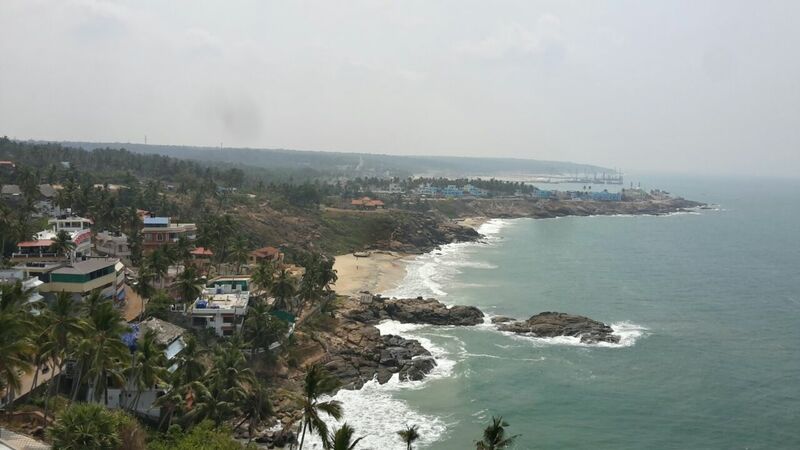 From there I wanted to go to Kovalam beach. 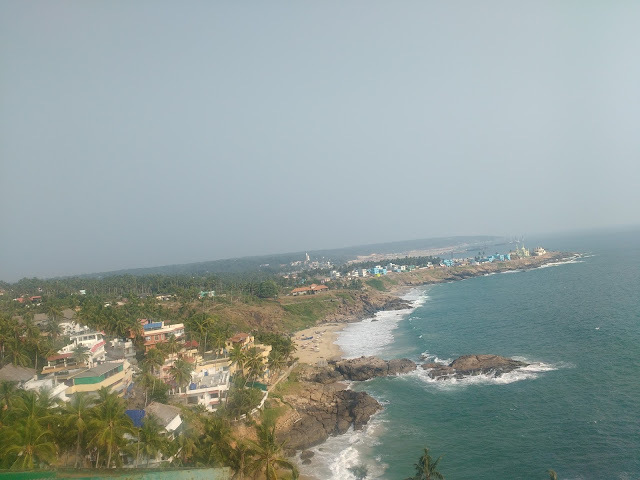 So I reached Kovalam beach from East fort bus stand (1 km from Trivandrum central ). This beach was very commercial. I went up the lighthouse and saw the entire view from the top. After Kovalam it was time to reach Trivandrum railway station. This trip gave me many different experiences. Language problem turned out to be both good and bad for me. Bad in the sense I would not be able to ask others about food and places to see. But that did not become a major problem as I should figure out these things myself. So that wasn't a big deal. The good thing was, maybe because of this, I didn't speak much to others. Usually when I go to trips with friends, I would talk non-stop the entire period. This one time I spent time with myself more than talking to others and liked it. 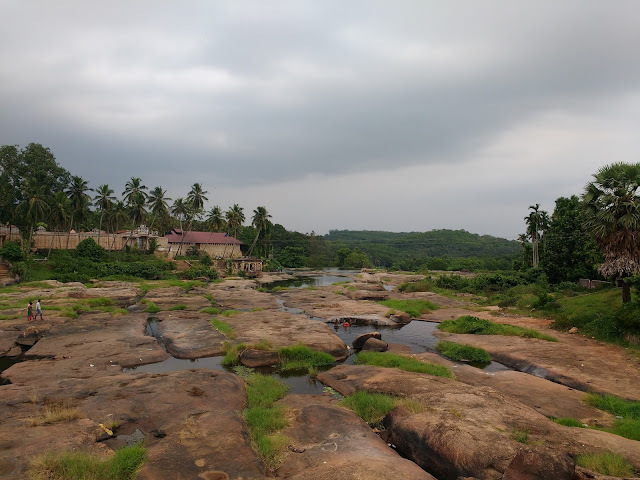 The only fear in this solo trip was that I couldn't keep my mobile and wallet safely (the things I totally depended on during the trip - including booking tatkal tickets). My heart kept saying that just like I won't take others' bags, others won't take mine. But mind often asked what if someone takes something. In the end, heart won ;). Finally I boarded the train to Chennai.